Twitter contacted us a few days ago requesting that we change the name of Touiteur because it could create a confusion with their service. We took the opportunity to change the name to something else and have been accepting suggestions from people, which helped us to pick a new name with more than 5000 voters in a short timeline. 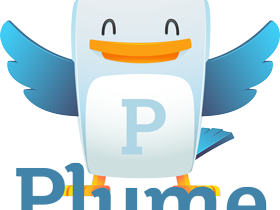 Welcome to Plume! For the occasion, we are revealing the new logo which is a slight variation of the old one. An updated version of Touiteur/Plume will be released shortly (probably tomorrow) reflecting the name change, but also with a lot of optimizations and bugfixes compared to the market version. Once the version is released in the market, we will reflect the change on Twitter and tweets will be sent “Via Plume” instead of “Via Touiteur”. Then the last step will be to modify the website according to the name change! Our Website has Level Up! Plume 2.15 available for all! Pingback: Touiteur Officially Becomes Plume | Droid X2 Life: A Droid X2 Community Blog - All about Android and the DROID X2 lineup of phones, Rooting, Apps, Reviews and Videos.